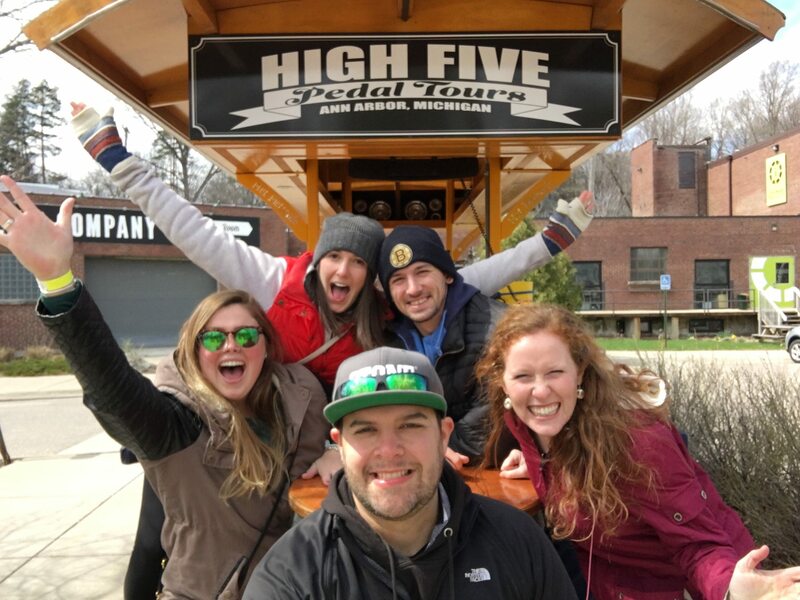 Well, High Five Pedal Tours is officially open in Ann Arbor! I am extremely excited about this. The ribbon cutting and kickoff party were held on March 2nd. We cut the ribbon at Ann Arbor Distilling Co. and headed over to Arbor Brewing Co. food, delicious Michigan made beer, and some entertainment from Pointless Brewery and Theater. Developing partnerships with local establishments and talent is something I take pride in. Each of our preselected tour stops in downtown Ann Arbor are owned and operated by local small business owners. Our entertainers, which you can book for an additional $25, are also local. Pointless Brewery and Theater is a brewery and improv theater with amazing talent and plenty of activities for both adults and children, including improv classes. The Violin Monster is an Ann Arbor staple. He recently visited Los Angeles where he auditioned for America’s Got Talent, and New Orleans, where he spends his winters. Luis Resto is an amazing Michigan talent, who attended the University of Michigan while majoring in music conservatory before leaving to pursue his love for music; turns out that was a pretty good choice. Since, He has worked with many well known musicians, including Frank Sinatra, The Highwaymen, Anita Baker, Patti Smith, Yellawolf, Jay-Z, and many others. Oh, and he also won a Grammy and an Oscar for cowriting “Lose Yourself” with Eminem. The first official tour was scheduled to depart from Ann Arbor Distilling Co. on April 2, but Mother Nature had different plans and decided to throw wind, snow, and freezing cold air at us, resulting in the tour being cancelled. However, the following day the second official tour was scheduled and went off without a hitch! It was a small group of four. A young couple who work for the Alumni Association of the University of Michigan had a couple friends in town who wanted to take a ride. They decided to book a beer tour with stops at Arbor Brewing Co., Ashely’s, and Grizzly Peak. Although the weather was still on the frigid side, these native New Englanders wouldn’t let it stifle their fun. Meeting new people and showing them a great time is what it’s all about for me. I want all passengers to have an enjoyable experience on any tour that is booked. Based on their comments on their group photo posted on the High Five Facebook page, that was achieved! Here’s to a fun and exciting year in downtown Ann Arbor. I hope to see you on the bike!